This recipe to me, is like the lovechild of baked ziti and lasagna, taking the best notes from each of these classic culinary creations. Moreover, it's easy, affordable, and can easily be health-ied up without sacrificing taste. Feel free to cut this recipe in half if you're only a cooking for a few, as this recipe made about 8 nice-sized portions. The meaty, tomato-y sauce in this recipe is best paired with red wine. I would recommend Chianti or Sangiovese (they come from the same grape), as these also pair well with the mild flavors of mozzarella cheese. 1. Preheat oven to 350 degrees F. Spray your casserole dish with non-stick cooking spray. 2. Cook your pasta of choice per package directions. 3. 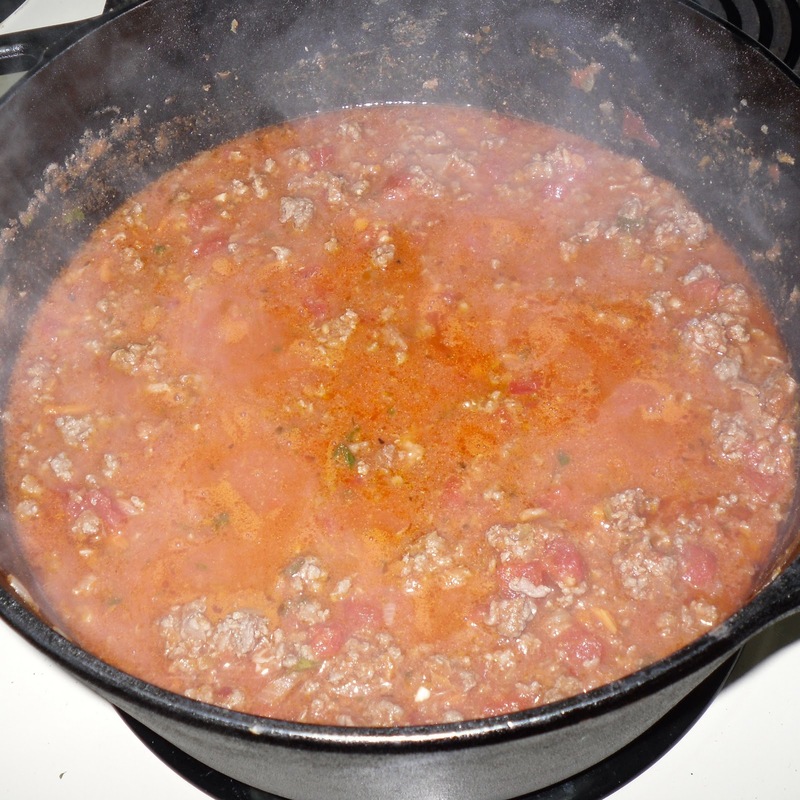 Cook ground meat in a large skillet over medium heat until brown. (Optional - season meat with garlic salt and pepper, to taste.) Drain grease/fat from pan, then add pasta sauce and heat til simmering. Remove from heat. 5. Now, time to layer! 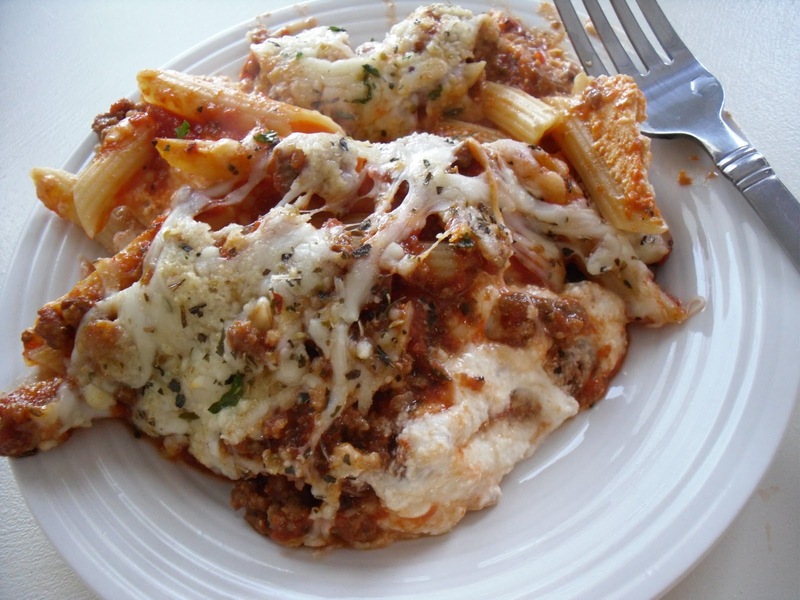 Pour half of the sauce mixture and half of the pasta in the bottom of your casserole dish. Stir together. Next, layer half of the cheese mixture on. Pour the other half of the pasta mixture next. Then, add the rest of the sauce on top. Cover the top with the rest of the cheese mixture. Top with remaining 1 cup of mozzarella cheese. 6. Sprinkle the top of your casserole with the dried oregano, dried basil, and garlic salt or powder, as well as the crushed red pepper flakes for an added bite if you like. 7. Bake for 30 minutes, until cheese melted and just starts to brown. Variation: If you have the time, I like to spruce up this recipe with the addition of roasted garlic. Drizzle olive oil on 4-6 cloves of garlic and wrap in foil. Bake in oven for 30-40 minutes at 375 or until soft and spreadable. Mash the garlic and mix with cheese mixture for added delicious-ness in your layers! *Note: Real Simple Bolognese Sauce - I've made this delicious recipe from Real Simple before and it would be a superb meat sauce for those who prefer an ever more home-made taste.